← DIY Manicure: Ombré Nails, try it! I love dips, they’re great to serve to guests, with some rye mountain bread wraps, cut up and toasted, or to add flavour to eggs and chicken, which when you eat a lot of sometimes need that something extra to prevent your diet from becoming monotonous. Combine yoghurt & juice in a bowl. Add remaining ingredients & mix. Put everything (except salt & pepper) in a food processer & whiz. Add salt & pepper to taste. Using a blender, blend cottage cheese until smooth & creamy. Put cottage cheese in a large mixing bowl & add all other ingredients, mix until well combined. Store in fridge. 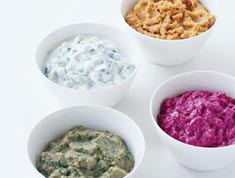 I love dips, but they are obviously not the healhtiest choice! But these recipes (which are also simple, as I am no chef!) are great! I’m certainly going to try some! 🙂 So thanks! They are so quick and easy, and usually with ingredients that are on hand, for me, in pantry fridge and freezer. Give them a go, and let me know what you think. I like to use full fat greek yoghurt to keep it real and clean, but fat free would make them lower in fat and cals, and there are some great brands that are just as creamy and tasty and the full fat that i’ve had and not even realised I bought low fat until I read it. Glad you like, thanks for reading.